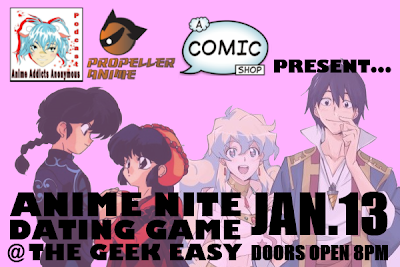 Propeller Anime: Anime Nite Dating Game @ The Geek Easy January 13th! We're here to help you out! Propeller Anime will be bringing in Anime Addicts Anonymous to host a spin on their event "The Great Cosplay Dating Game." This event will be on Friday, January 13th and 8PM at A Comic Shop, located at 114 S. Semoran Blvd Winter Park, FL 32792. One lady will pick from three guys to be her date and then one guy will pick from three ladies to be his date. We will be giving our prize dates free reign to ask the contestants questions as raunchy or personal as possible. 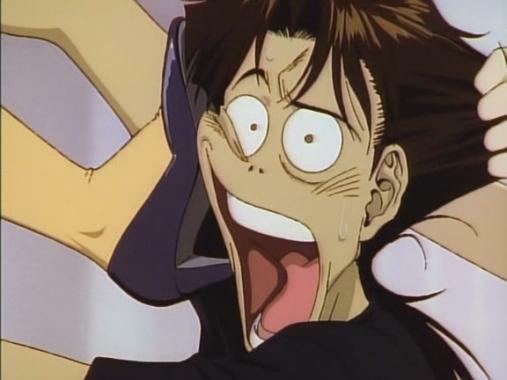 Propeller Anime will provide prizes for our new happy couples to help them out and they'll even show some cool anime afterwards that show the more amusing side of hooking up. If you want to be a part of the dating game, either as the prize date or a contestant, be at A Comic Shop by 7:45PM. Anime Addicts Anonymous will take care of you from there.